South Gujarat in a key industrial region and has flourishing industrial estates at Ankleshwar, Sachin, Navsari, Gundalav, Pardi, Umbergaon, Bhilad and Vapi (Asia's biggest industrial estate). Therefore, it is a key exporting centre of commodities like textiles, agriculture, floriculture, aquaculture, dyes, chemicals, pharmaceuticals, electronic components and gems and jewellery/diamonds. It has the country's biggest man-made textile industry. Surat, the headquarters of the South Gujarat region, is the second largest city in Gujarat and the eight largest in India. It is also the fourth fastest growing city in the world. 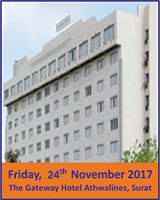 EXIM INDIA is pleased to organize a 'South Gujarat' Business Forum on Cargo & Logistics at Hotel The Gateway Hotel Athwalines, Surat, Gujarat on 24th November 2017.
Business Forum – Its wide-ranging deliberations will see industry stalwarts, policymakers past and present, and experts expound on a variety of issues concerning the maritime and logistics sector. The Business Forum will bring port authorities, investors, developers, operators, users, service providers and key players connected with the maritime industry in South Gujarat, as well as the rest of India, together on one platform to interact with each other and take part in panel discussions on important issues, challenges and opportunities. It has become the MUST attend event for all the key decision makers of the industry. So, join us at South Gujarat, to discuss, deliberate and network in the maritime, cargo and logistics sector. You can also be a partner to this much-awaited event and expand the horizons of your knowledge and business. It will be an occasion to learn, savour and network.